Boardgaming in Perth | Action Points! Soo.. I’ve been in Perth for work for the last month, and will probably continue to be here until October. Without my heap of games and network of willing accomplices, I haven’t been doing a lot of gaming the past month. Plus, I was taking my time getting used to a new city and new project. 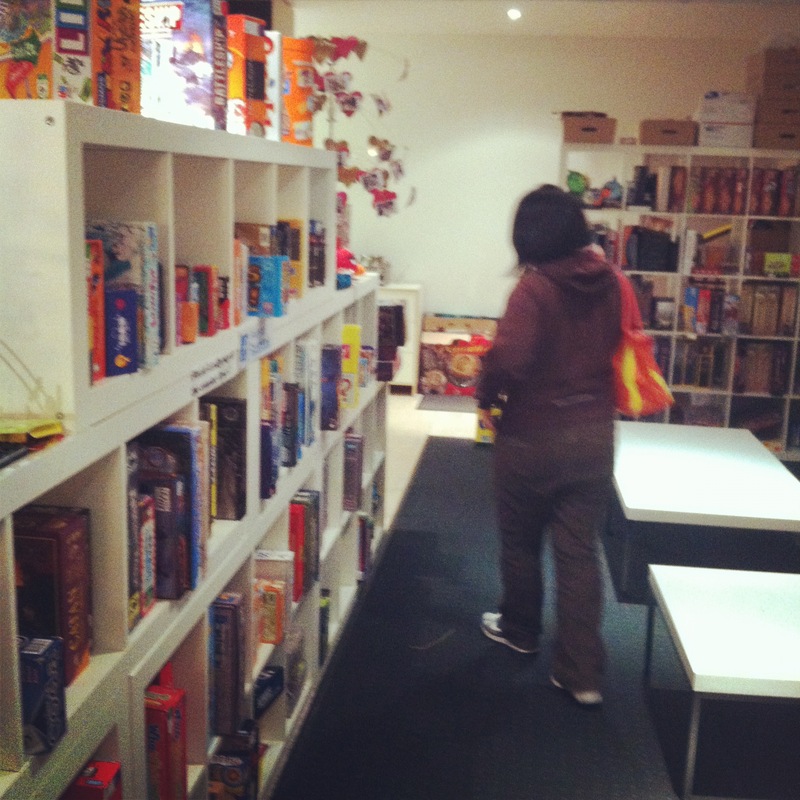 I did manage to visit Tactics, which is a pretty good game shop in Perth. 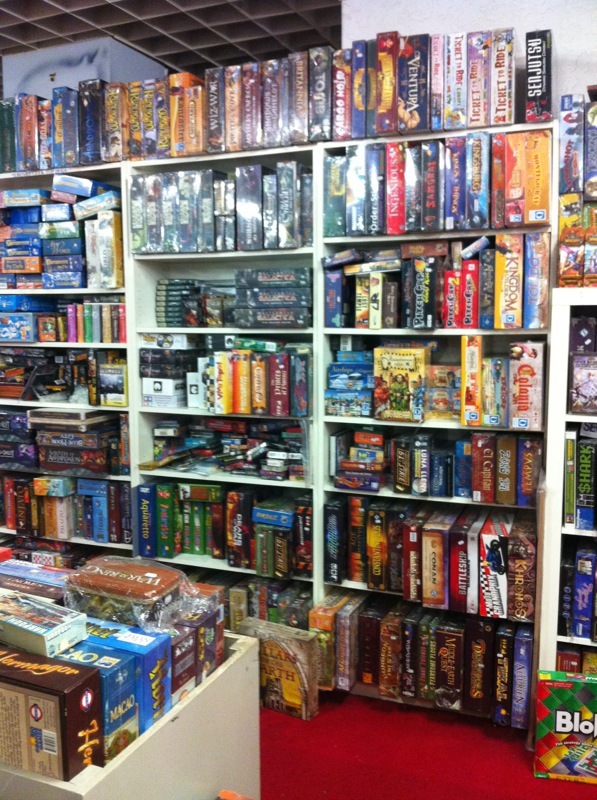 They have an amazing selection of wargames and RPGs, but also have a decent amount of board games. I also visited Empire Toys and Quality Comics for my comic book fix, but I’ll touch on that in another post. The situation changed once I moved from the hotel in the city to Northbridge. 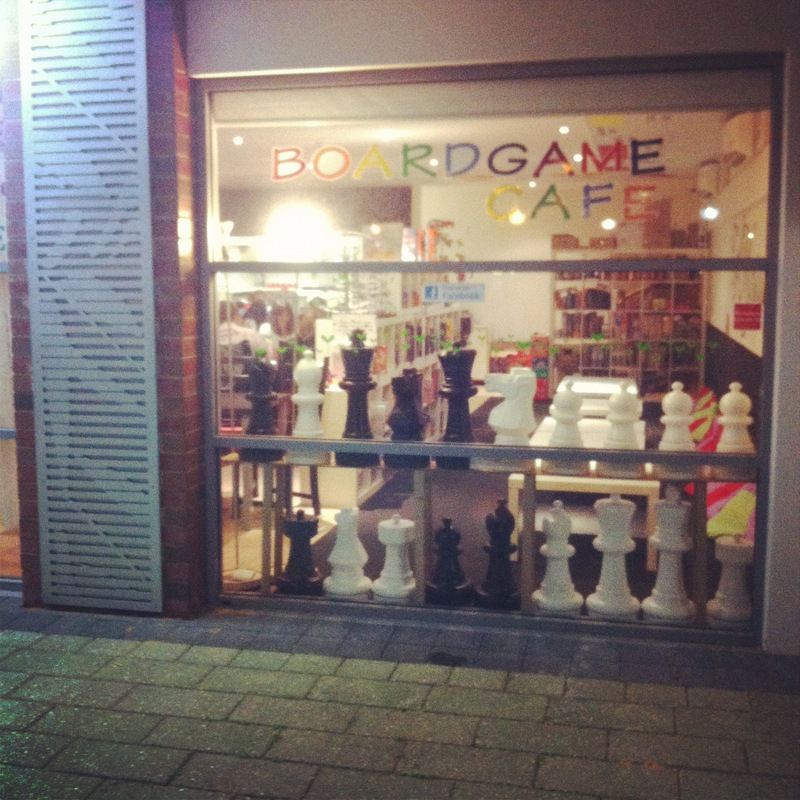 I found a board game cafe which is pretty close to my current apartment, Cafe Myriade. It’s situated on Lake Street in Northbridge. Also, Jeannie had arrived for a holiday and I had a gaming partner! 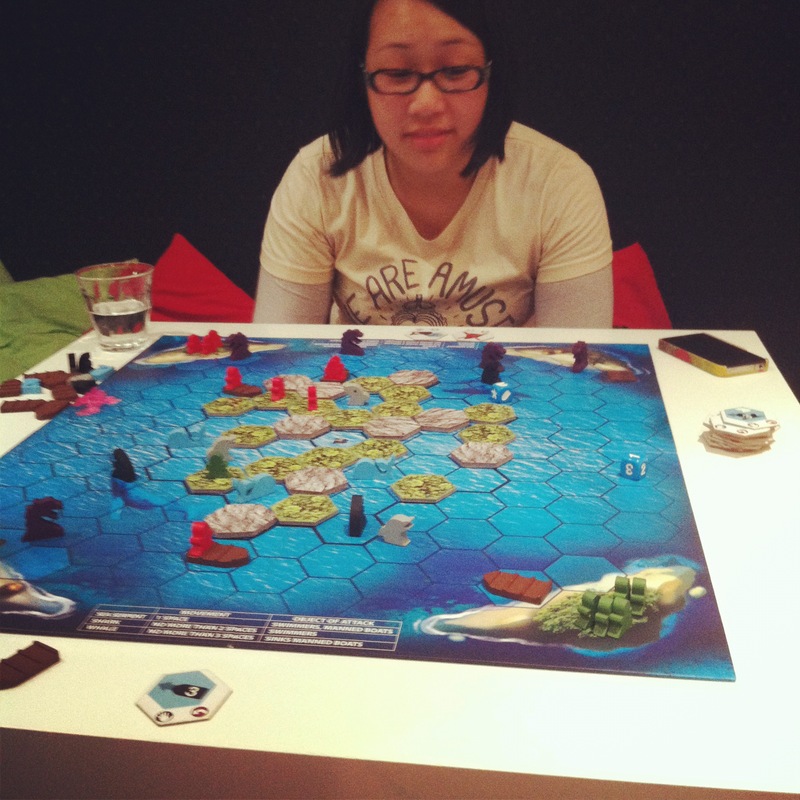 So, one night we decided to pay a visit to Cafe Myriade and played Survive: Escape from Atlantis!. It’s a pretty simple and fun game where you move meeples from a sinking island through shark and sea monster infested waters to safety. We also played with the dolphin expansion. Here, you can see I’ve moved a sea monster to gobble up one of Jeannie’s vulnerable meeples. 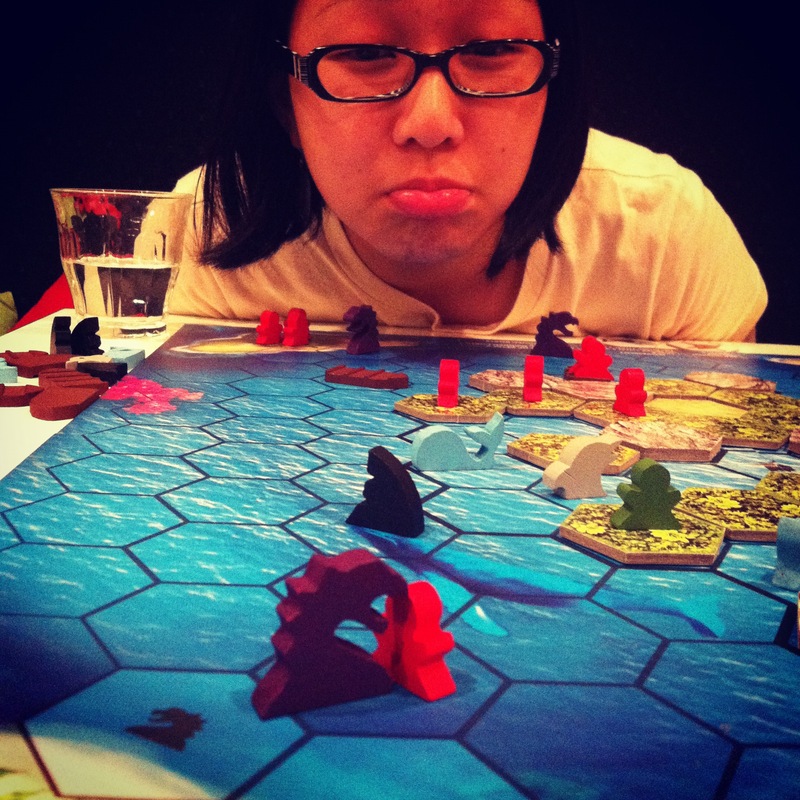 Unfortunately, Jeannie managed to gobble up a whole boat’s worth of my meeples and won the game handily! The person who was helping us and taught us the game was very nice and helpful, and the atmosphere and the cafe was pretty nice and casual. The game selection is pretty good, but skews more toward lighter, casual games which I’ve found to be common in game cafes. There is still a decent number of strategy games though. They also had a good selection of sweets and drinks for order, although we did not get to try any, since we were still quite full from dinner. We left with a pretty good impression of Cafe Myriade, and I knew I had found a great place to hang out and play games. The next night, we ended up at Cafe Myriade again. This time, we met up with Michelle and Wern after dinner and decided to get some games in. Cafe Myriade usually charges $5 for the first hour, and I think it’s $2 for each subsequent hour. However, you can also get package deals for 2 hours and drinks, which we took up this time. 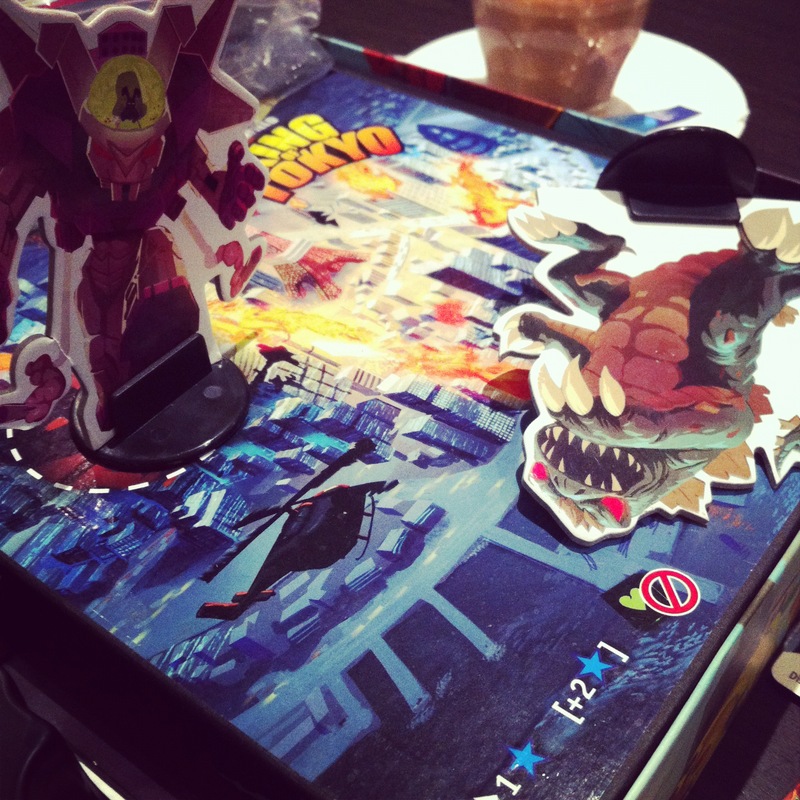 The first game of the night was King of Tokyo. 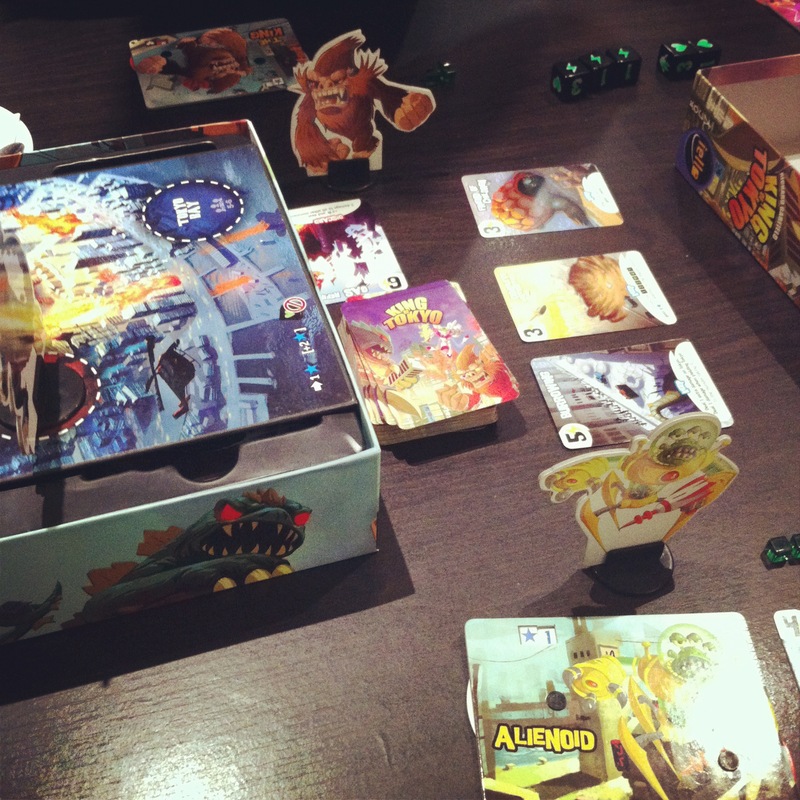 I’ve reviewed this game before, and it’s a great casual dice rolling smash-fest. Michelle was a monster at this game, gaining heaps of energy and kicking our collective butts. Jeannie was the first to fall, and I died the following turn. Wern held out the longest, especially since he had the “It has a child!” card to get a second go. However, none could stand agianst Michelle’s (Cyber Bunny) monstrous might and she was victorious. The cafe was much more packed this night, and there were multiple large groups playing different games. There was one group that was getting pretty loud. Not so much loud, but high-pitched. And loud. The staff were helpful and friendly, but probably could have done better to manage the noise level for the comfort of others. It’s also great that they have Monopoly decorations on the ceiling, with properties corresponding to major Australian cities. 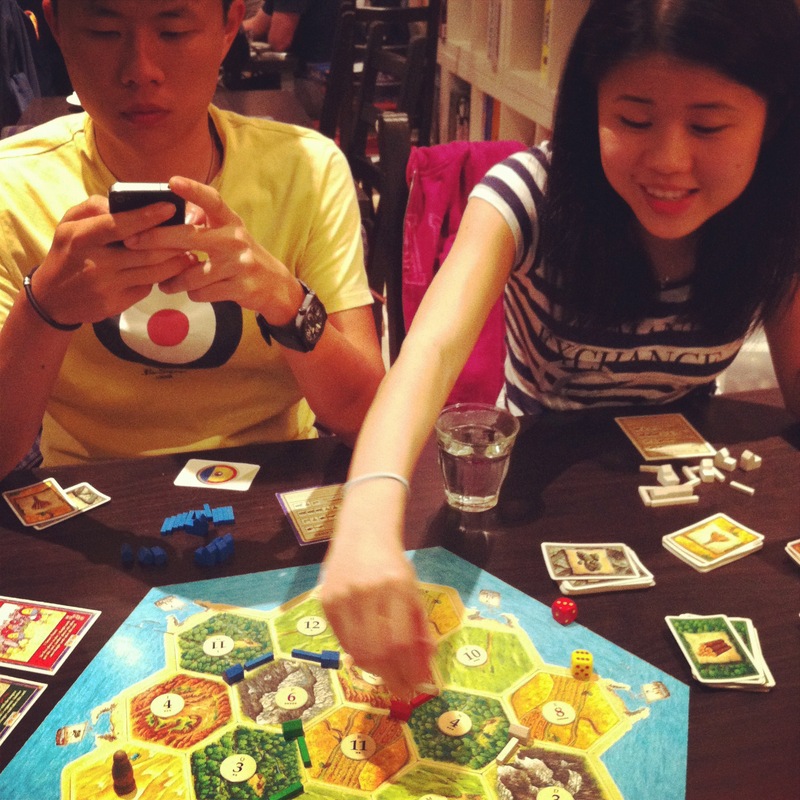 We played The Settlers of Catan next. I had a bit of trouble explaining the rules over the howls and shrieks from the other table (damn you Pit!) but we managed in the end. Wern had a pretty good economy going, and Michelle was queen of wheat, but ultimately Jeannie made good use of the wood port and claimed victory! 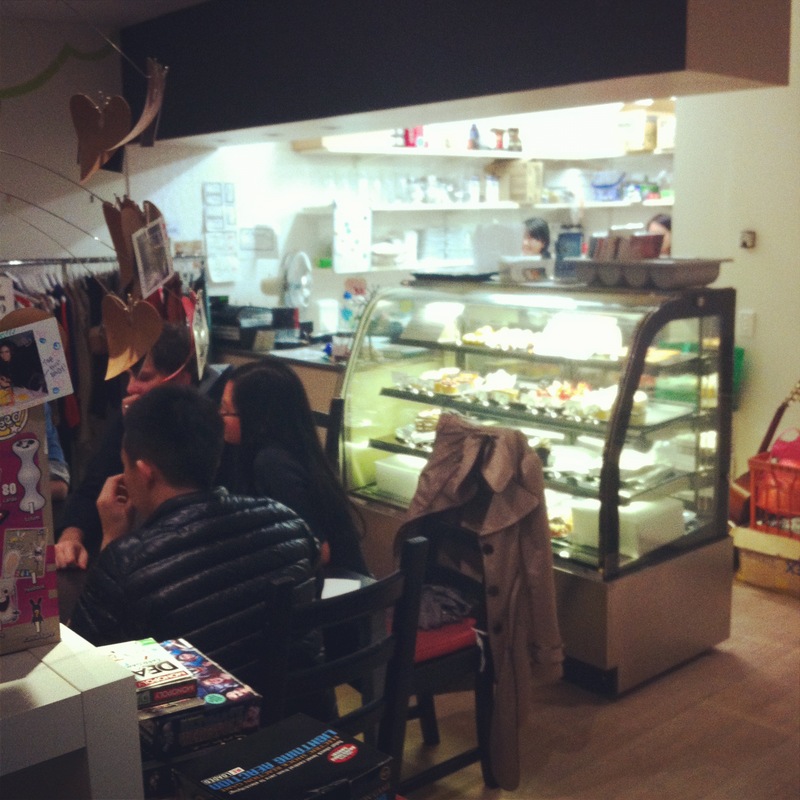 I visited Cafe Myriade again just last Friday and played a couple of games of Dominion. Once again, it was pretty full and lively, which is pretty nice to see. I was kind of bummed out when MyCube in Melbourne closed down, and I hope that Myriade will enjoy continued success. The people are nice, the price seems right, and the games are good. My suggestions for improvement would be to have a cleaner system for tracking time and maybe game menu (like they had at MyCube) and some quick rules reference sheets for the games (again, like they had at MycCube). Then again, that’s what the staff are for, but it’s nice to have the option of making the decision yourself and having a reference handy when the staff are busy. 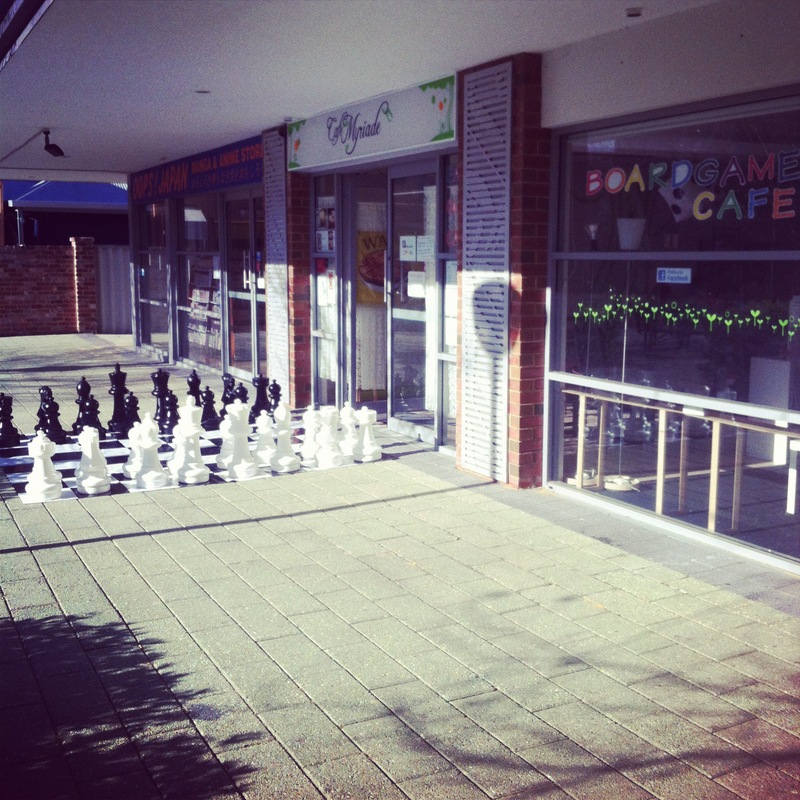 On weekends, they even put out the giant chess set and it’s a great way to get people interested in the cafe. Overall, I have had good experiences at Cafe Myriade and I recommend it for anyone who wants some casual gaming in Perth. Thumbs up! 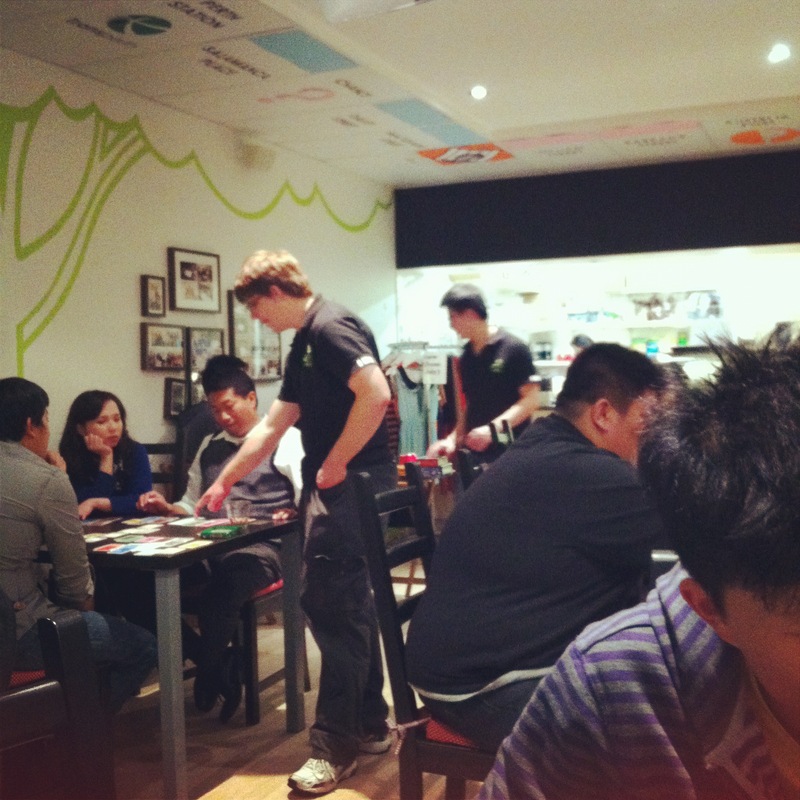 I wish we still had a board game cafe in Melbourne. With the current surge in popularity of board games, I think it’s time someone had another go. Until next time, happy gaming! 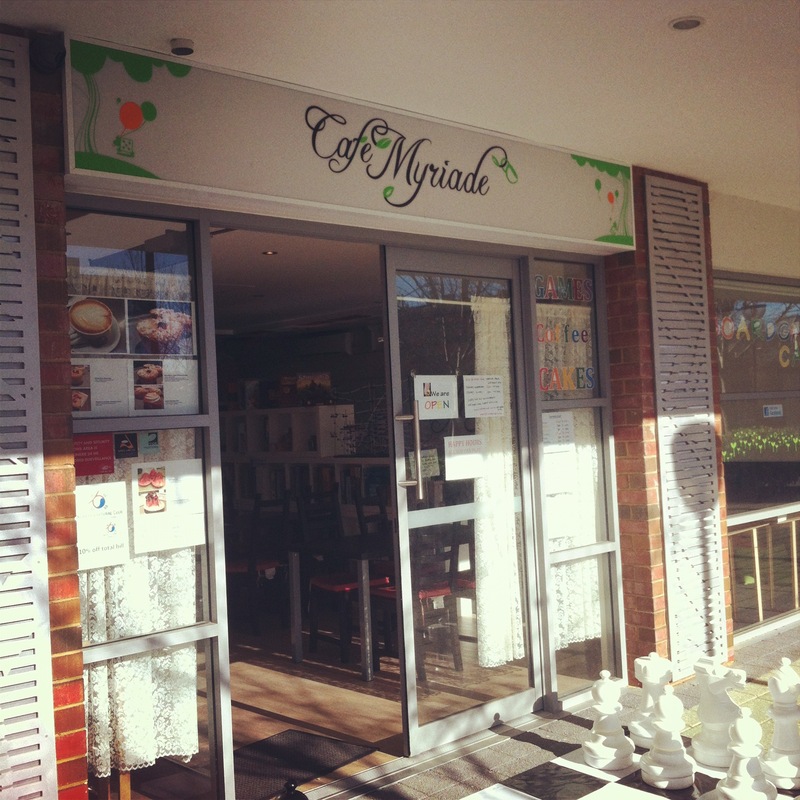 Hi Aaron, so glad to see your detailed experience and review of Cafe Myriade here! I manage the cafe and am always looking out for any feedback to improve our service further, and make all experience here more enjoyable. First of all, so sorry about the noise level in the cafe, we are working on how to advice groups with excessive amount of noise and at the same time not sounding like a put off to them – as some of them seem to come here for a shout/scream on a game of Ugly dolls or Pit to destress :) but we are definitely thinking of ways to mitigate that. Secondly, it’s good that we are compared to MyCube in Melbourne as I actually approached the owner there (one of them is my friend’s friend) for advice before we open. It’s a pity though I didn’t get the chance to visit and see how they function. But we will start including quick reference to each game as you suggested :) we will hopefully start making menus with game list on it. Great suggestions! With tracking of time, I’m actually not sure how to make it more cleaner due to my limited experience and knowledge in business, do you know how MyCube keep track of play time? Again, really appreciate your write up about the cafe so we can see things from a customer’s perspective :) looking forward to seeing you and your friends here again! Do let me know if you have any more suggestion and comments too.